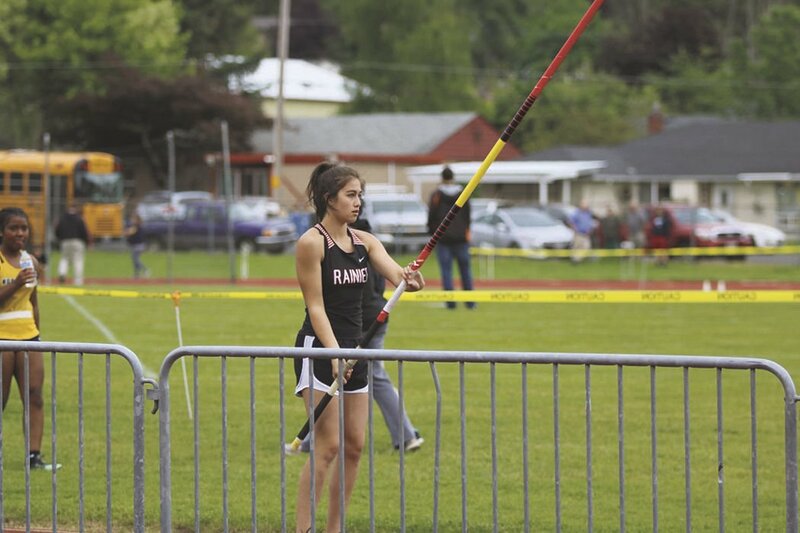 Jordyn Davis readied herself to pole vault at a track meet during a previous season. Her condition has forced her to not go out for track this year due to chronic pain and nausea. Jordyn Davis was potentially on the path to state wrestling this season before her condition called celiac artery compression, caused by Median Arcuate Ligament Syndrome, caused her to end the season early. Jordyn Davis participates in cheerleading at Rainier High School. The surgery that Davis must undergo could affect her ability to cheer at the collegiate level due to costs and scheduling. When she’s not cheerleading, wrestling or participating in track and field, Jordyn Davis can often be found volunteering in the Rainier community, or taking photos for the Nisqually Valley News. Except this year, her senior year, she was forced to end her wrestling career early and will not be able to run track. Even her future as a potential collegiate cheerleader could be at risk. All of this is because of a little-known syndrome that she’s been battling for at least six years, which was just diagnosed. Courtney Davis, Jordyn’s mom, said the condition is called celiac artery compression, caused by Median Arcuate Ligament Syndrome. This spring, Jordyn will be having surgery to cut the median arcuate ligament and to possibly reconstruct the celiac artery, she said. However, the only surgeon who has actually performed the operation Jordyn needs practices at the University of Chicago Medicine. To help pay for trips to and from Chicago, the Davis Family’s friends have rallied around them and are helping them to put on a dinner and auction event from 5-8 p.m. Saturday, April 6, at Yelm Eagles on 11609 Koeppen Road S.E. A $10 spaghetti dinner will take place from 5 p.m. to about 6:30 p.m., which will be followed by a live auction and raffles from about 6:30-8 p.m.
For the auction so far, the Davis Family Fundraiser has secured a chainsaw, a free birthday party certificate from Yelm Gymnastics, wine baskets, a painting from a Rainier family, a gift certificate to the White Horse Tavern for a steak dinner, a wash and wax from Thin Blue Line and more. The fundraiser’s goal is to take some of the financial pressure off of the Davis Family so that Jordyn can walk the path to recovery, Davis said. Davis said the fundraiser is all about a small town rallying around a family in need — specifically, a girl in need — which is something that the Davis Family doesn’t hesitate to do when the shoe is on the other foot. Through the Eagles, they outpour their generosity on people who need it. And Jordyn’s grandmother, Belinda Hayner, has even jumped into organizing relief efforts for people who have lost their homes due to fire, in addition to volunteering her time for the Nisqually Valley News and other places she works. Jordyn has volunteered her time at auction events that benefit scholarships and education throughout the years, but said she is humbled that people would rally around her in her time of need.